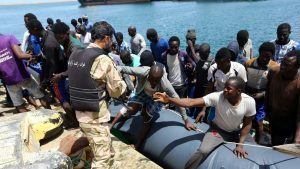 Libya rescues 129 migrants stranded at sea – Royal Times of Nigeria. Gunmen mugged 129 migrants on a rubber dinghy headed for Europe and also stole the craft’s engine, abandoning them off the Libyan coast, Libya’s navy said on Saturday. Navy spokesman General Ayoub Qassem said the gunmen in a speedboat chased the dinghy on Friday, boarded it around five nautical miles off the town of Zuwara and stole the migrants’ possessions. The migrants from sub-Saharan Africa, including 27 women and two children, were stranded at sea for several hours before being rescued by Libyan coastguard alerted by a local fisherman, Qassem told AFP. The International Organization for Migration said a total of 371 migrants were rescued on Friday thanks to the intervention of fishermen in three separate incidents off Zuwara. The Libyan coastguard said on Saturday it rescued another 168 migrants whose boat had run into trouble off Tripoli but was unable to assist a second vessel with an unknown number on board around two nautical miles away. “This type of operation takes a lot of time. We don’t have the means,” said Qassem, calling for international relief groups to provide Libya with boats and equipment to save more migrant lives. In the first three months of 2017, more than 24,000 migrants arrived in Italy after making the perilous crossing from Libya, up from 18,000 in the first quarter of last year, according to the UN refugee agency UNHCR.